TORRES: Said that the ‘work plan’ will ‘recommend’ structure plans. Stated that structure plans ‘contain a shared vision’ of’ how our activity centres should develop and evolve’. Said that council has in the past discussed structure plans but ‘things have changed today’. Now they ‘believe there is a strong need to further develop structure plans in our activity centres’. Claimed that this was because ‘the planning landscape is very different to what it was in the past’. Said ‘in the past our policies were defensible’ at VCAT. But ‘today it is a very different storey’. ‘VCAT is brazenly over-riding or ignoring our policies’ and ‘VCAT is expressing to us where they believe our policies fall short’. This makes things very difficult when council’s policies ‘can be challenged and over-ridden’. The other thing that is different from the past is population growth and ‘Melbourne’s development boom’. Also Plan Melbourne Refresh has ‘clearly suggested’ that municipalities like Glen Eira will have to accommodate ‘the majority of Melbourne’s increasing population’. So all of this combined has lead for a clear ‘call to better manage’ growth in ‘our activity centres’. There’s a ‘call for greater clarity, greater certainty’. The tools used could ‘take the form of height controls’; ‘development contributions’; ‘perhaps car parking precinct plans’ and ‘perhaps a mix of different zones’. In order to ‘achieve’ all of this they need the ‘foundation’ of structure plans in order to deliver all of these tools. It’s not a case of one size fits all because ‘not every shopping centre is the same’. Bentleigh residents were strongly represented in the feedback and they put in a ‘strong call’ for lower height limits in ‘that shopping centre’. Said other shopping centres also called for height limits but these were of a ‘different flavour coming from those shopping centres’. Thus ‘we believe that structure plans can deliver that shared vision’ and the necessary ‘controls’. We challenge the repeated propaganda that is now par for the course that VCAT is the major villain in all our woes. We challenge even more vigorously the total untruth that ‘in the past our policies were defensible at VCAT’. Council’s ‘policies’ have never been ‘defensible’ at VCAT! The following table provides clear evidence of this. We have gone through every published VCAT DECISION from 2003 until the present day. We have tabulated all those decisions which either overturned council’s decision, varied them, or confirmed them. These figures do NOT INCLUDE permits granted as a result of Practice Day hearings or Mediation, since VCAT does not publish these. Thus we have no record of how many times council may have caved in to developer demands at such meetings and the application never went to a full hearing. Further, on variations, this overwhelmingly involved the developer objecting to conditions that council had imposed. In well over 90% of cases, the conditions were thrown out or greatly modified. Another ‘victory’ for the developer! And as further ‘proof’ to our claims we present extracts from VCAT member decisions dating as far back as 2001 and 2006. The arguments that the developers used then are still being used today and the gaps in the planning scheme have remained since these earlier cases. That is inexcusable. Council’s task should be to analyse every single VCAT decision and to attempt to plug the holes. The holes have been there for eons and nothing has been done. It is high time that this council admitted the truth – their total unwillingness and/or ineptitude in dealing with planning issues! Unless this Planning Scheme Review includes a full and comprehensive analysis of all VCAT decisions and makes definitive recommendations on how to address the policy failings, then nothing will change in Glen Eira. 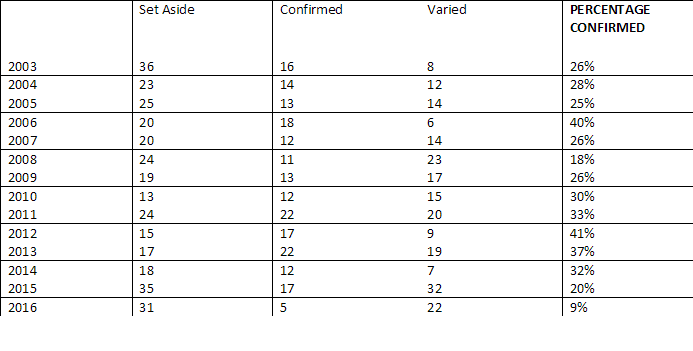 Here is the said table and the percentages refer to council’s success rate in having VCAT confirm their decisions. This is followed by the extracts from earlier VCAT decisions. Thus for a council which can’t even come close to having at least half of their determinations ratified by VCAT, then something is drastically wrong – either with the planning scheme itself, or with those who are duty bound to enforce it. While it formed no basis for discussion in the officer report and while the grounds of refusal are silent on the issue, Council now claim that the proposal offends the “character” of this area. Council submitted that “..the combined mass, height and scale of the building do not provide an acceptable degree of change in the neighbourhood context.” Council believe that the proposal is not of a high standard design although I note that at no stage in the planning scheme has Council indicated what it wants McKinnon to look like. The Tribunal therefore thinks it is misleading to “piggyback” the residential urban character ambitions of Council on to this commercial centre. Reliance on “character” as a basis for a decision must have its limits. It simply cannot be used as a reason for every modification or rejection especially when the MSS is silent on its relevance in specific areas. Secondly, there is no suggestion anywhere from Council as to what the character of the McKinnon shopping centre is anyway. There is no relevant study; as noted already, there is no MSS position; there is no Design and Development Overlay to refer to, and there was no attempt in either the Council report or the Council submission to define what makes up the character of this area. On the Tribunal’s observations, the centre appears as an attractive local neighbourhood centre which hosts a variety of uses and building styles with interwar double storey shops being the dominant built form. There is already evidence of change taking place with newer buildings being constructed or permitted. Private industry would never stand for such results. Directors and senior management heads would roll. Councils promote them. Table shows up lots of things. 1 – numbers of vcat hearings aren’t going down but up and the zones were supposed to bring “certainty” and less vcat appeals. 2 – urban villages and c25 haven’t worked either. Council keeps getting trounced at vcat all through. Urban Villages and C25 comment is unjustified as Council has never implemented what it was recommended and promised to do in 2003 ie.
. Undertaken significant traffic management and parking management studies. A comparison with Council’s who undertook the structure planning highlights just how appalling Glen Eira’s Planning has been. Other Councils, while not always successful at VCAT have a much higher success rate than Glen Eira has. Re the years of ineptitude of Glen Eira Councillors and Town Planners. You need look no further than Akehurst’s 2013 report on how wonderful the zone implementation was. He described structure plans as a waste money and since Glen Eira hadn’t implemented them it has saved heaps of dollars (god only knows where the savings went, probably on pavilions and more staff) while other Councils had wasted heaps. Now in 2016 we have the Minister ordering Glen Eira to undertake structure planning and Council happily announcing that they will undertake them (without mentioning the 13 years lost to incompetence). All I can say is thank god, that in December, 2015, the Minister decided to reject Glen Eira’s application for an extension to their exemption from public consultation on planning and forced Glen Eira to undertake proper planning ie. structure planning. The developers want in all every square millimetre of land, and the bureaucrats are only to willing to hand it over. Having these same compromised fools now in charge of writing their own get out of jail free card, is only going to lead to a bigger disaster than you have ever seen. The developers have paid good money for this lot, and they ain’t going to let them go. Clearly things are different. The development industry has become more rapacious and council has become more stagnant determined to facilitate development as much as possible. The zones have achieved this. Whether or not the planning scheme review will put a brake on the overdevelopment and give residents some peace of mind is questionable given council’s track record and the performance of councillors. And the total absence of any consideration for interim planning controls while they address issues that should have been addressed eons ago. As expected the meeting was simply an exercise to say that Glen Eira residents have had the opportunity to have their say. Also an excuse to slow down the process. What a sham. Councillors step up and truly represent your constituents. Stop making excuses for the rampant over-development and lack of planning. It’s time to put some real changes in place that will give residents a voice at VCAT. At the community session I attended, the MSS was bypassed as a topic, which constrained the feedback provided. Since it hasn’t been updated and is so out-of-date, there’s a lack of strategic justification for the decisions made by both Council and Minister for Planning. Clarity and certainty have not and never will be achieved if the Scheme basically is “performance-based”. That’s why developers donate so much money to the major political parties. As Ron Torres knows, the new residential zones were imposed by the Minister exercising his powers under S20(4). The changes weren’t subject to public scrutiny. The choice of zones and the contents of each Schedule lacked strategic justification and were far from neutral. Council doesn’t know what the consequences would be if the entire municipality was developed to the maximum currently permitted. Indeed it could be argued that future growth is unbounded because there are no height limits for significant chunks of land, including commercial zones and PPRZ. And no minimum lot size. Since Planning Ministers, and this includes Richard Wynne, are quite prepared to make unilateral changes to Planning Schemes without strategic justification, they should be prepared to introduce interim height limits while structure plans are prepared. Talk of “1080” additional people a year is a furphy. Nobody, and that includes State Government, knows what Australia’s immigration policy will be 10 or 20 years from now. We have 20000 people more in Glen Eira currently than projected by the same people providing the data behind “1080”. Also absent from the summary session was any discussion about the Objectives of planning and the role they should play in drafting a Planning Scheme. Discriminatory policies can never be said to be fair. NRZ is overused because nobody, including State Government, trusts VCAT. Since 70% of Glen Eira is zoned NRZ, VCAT’s view is the other 30% has to accept much larger developments than would otherwise be required. We still haven’t seen any justification from any decision-maker for the decision to impose RGZ where they did. How did “200m” distance as a starting point for Housing Diversity under C25 morph into 700m and 4 storeys? Cr Hyams should be able to answer but has chosen not to. From the workplan I don’t see anything that could be used to regulate rate of change. Indeed Council has argued that the only development that is inappropriate is that which is prohibited. Failing to comply with residential amenity standards, which are already pretty weak, should be a red flag. In the meantime MRDAC, staffed with members of the development industry, has been busy collating a wishlist from the development industry for what changes they want made to Residential Zones.